Everybody loves red pandas, they’re cute, fluffy, unique and endearing. They are also unfortunately very endangered. No one knows exactly how many red pandas exist in the wild today, but some estimates report it to be as possibly as low as 2500 individuals, and this is spread through a vast area among the foothills of the Himalayas. A wild red panda’s main threat is habitat loss and to a lesser extent, poaching for its fur. 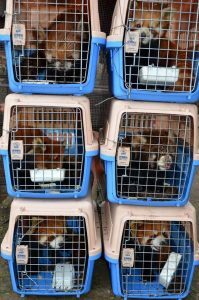 There is however another menacing threat to red pandas which is on the rise, the illegal pet trade (for example, 6 wild red pandas were found in the back of a lorry in Laos in January 2018- believed to be on their way to Bangkok to be sold as pets). Unfortunately, social media has a lot to answer for, we see many videos every day of endangered animals being kept in unnatural conditions in peoples’ homes around the world, these videos often have millions upon millions of views with thousands of (mostly innocent) comments of ‘I want one’ and ‘I need one’. 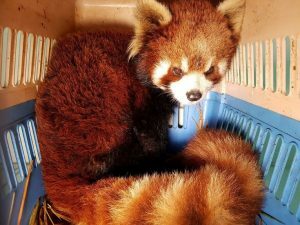 Red pandas are now being caught in the wild to traffic to big cities where people can make lots of money by selling them to people that have seen these cute videos online. Basically, a red panda would make an awful pet! Why so I hear you ask? They may be cute and look harmless but aren’t! They actually have incredibly sharp teeth, a crushing jaw pressure and razor-sharp claws which they can’t retract like a cat (they’re classed as carnivores don’t you know!). These are super adaptations for their lifestyle of climbing trees and munching on bamboo but also act as dangerous defence mechanisms if they felt threatened. They are solitary and don’t like company! Wild red pandas would rarely see another one, living a completely solitary lifestyle except for the short breeding season once a year. They like to be by themselves, and this includes avoiding humans too! Due to this lifestyle they generally don’t like being touched, so despite looking like you should be able to pick them up and give them a cuddle, this is not the case! They have a very specialised diet! 95% of a wild red pandas’ diet is bamboo, and this is thought to be made up of around 200,000 leaves every single day! In zoos they are fed lots of freshly cut bamboo which is supplemented with concentrated pellets, but these are very expensive. Their high fibre diet also leads to them pooing a lot! One animal can produce almost a kilo of poo every day!!! IT IS ILLEGAL! Being an endangered species, it is illegal to trade in them. If someone was caught with a live red panda they could be fined or even sent to prison! So, next time you see a ‘cute’ video of a red panda, or any other endangered species, being kept as a pet please don’t share it. It may be innocent, however the more shares and views these videos get, the more demand there is for people to take them from the wild. Instead, you can help us to help them by visiting our red pandas, Tilly and Nam Pang. Why not come and visit for our daily red panda talk or if you want to get even closer you could take part in a Meet the Red Panda experience. Our red pandas are part of a vital population management program in Europe and we also support their wild counterparts by fundraising for an amazing charity each year; The Red Panda Network. Special thanks for this research to Amy Heffernan, section leader & small mammals keeper at Paradise Wildlife Park, the Zoological Society of Hertfordshire.